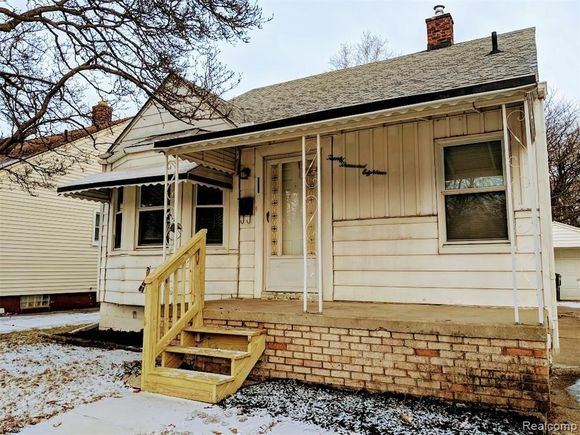 Fantastic fully remodeled bungalow in great area of Redford. Only a few blocks to schools and parks! The Home has a beautiful massive master bedroom with gorgeous refinished wood floors. The kitchen has been fully redone with new cabinetry, counter tops and updated appliances. The bathroom has also been completely remodeled. The spacious home boasts a beautiful entryway and wood floors int he living room and hall way area. It also has a large usable unfinished basement and a one car garage. Updates include newer windows, updated electric, updated plumbing, newer water heater, updated roof. Buy the home and move right in, no need to do anything! AGT Owned. Hello, I’m interested in 20018 Kinloch and would like to take a look around. The details on 20018 Kinloch: This house located in Redford, MI 48240 is currently for sale for $99,900. 20018 Kinloch is a 1,076 square foot house with 3 beds and 1 bath that has been on Estately for 1 days. 20018 Kinloch is in the Redford neighborhood of Redford and has a WalkScore® of 59, making it somewhat walkable. This house is in the attendance area of Beech Elementary School, Macgowan Elementary School, Redford Union High School, and Hilbert Middle School.